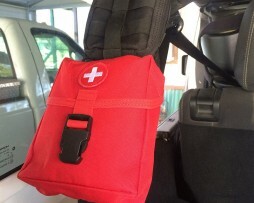 The New Platoon First Aid Kit comes in a new pouch, with M.O.L.L.E. straps in the back. The kit comes shrink wrapped wit a list of contents. The New Platoon First Aid Kit measures: 9.5”x7”x3” and weighs 1.5 lbs. The New Platoon pouch works great with our Style D and Style E MOLLE Bar Sleeves. A great place to carry your first aid kit in the Jeep. The Elite First Aid kit comes shrink wrapped with content list.